18" Rainsleeve (Set of 2) is rated 4.4 out of 5 by 290. Rated 4 out of 5 by Abu from Great price point Think of this as a disposal rain sleeve. Used it while whale watching in a zodiac, so there was plenty of sea water spray and the camera and lens stayed dry. It needs a little practise to get it on and make sure the front draw string sits on the lens hood. The draw-string kept slipping off the lens hood. To solve this issue put a rubber band on the lens hood and closed the draw string in front of it, that did the trick, no more slipping. It does take a little getting used to in handling the camera functions with this on. Practise with it before you actually need to use it. No regrets even if you tear 1 or 2 during practise due to it's affordability. Rated 2 out of 5 by Anonymous from good idea, but doesn't quite work I wanted to cover my camera and zoom lens with this sleeve to protect from dust during a horseback ride. At the lens end of the sleeve, there's a simple drawstring that bunches up the plastic and tightens around the lens. However, for this to work, there needs to be something for the drawstring to hold on to. But with my lens (Nikkor 18-200) there's really nothing, or at least nothing that a crude string will grab onto, so that when I extend the lens, the end of the lens simply pops out of the sleeve, thereby defeating the whole purpose of the sleeve. Well, my purpose, anyway. This product might work better with a fixed lens. Rated 4 out of 5 by Brian G. from An ok item for the money For the price you'd be hard pressed to beat this sleeve for emergency rain protection. As long as you don't tear it, it will get the job done...but if you plan to consistently shoot in rain you will need something better and way more expensive like a Think Tank Hydrophobia cover. Bear in mind you really can't properly use your camera strap with this on. Also, I have a Canon camera with a square eyepiece, so a little trimming was needed around the provided eye hole to prevent ripping. Rated 5 out of 5 by Red Peters from Excellent Occasional/Emergency Rain Prot I bought a pack of these sleeves to use when shooting outdoor sports in the rain. I'm not a pro photographer and couldn't justify the expense of the superior Aquatech rain gear. I needed something small and light that fits in my camera backpack and keeps me shooting during poor weather conditions I occasionally encounter.If you do a lot of shooting in questionable weather and can justify the $200 cost, the Aquatech is obviously a better solution. But for $ the Op/Tech sleeves are hard to beat in a pinch, particularly for casual photographers.The sleeves are large enough to cover most all but the largest of the pro telephoto lenses. It fits my D300 with battery pack and 70-200 2.8 with room to spare. The sleeve has a hole in the rear - just remove your eyepiece cover, stretch the hole over the eyepiece, and replace the cover to hold it in place. The sleeve has a drawstring closure in front that holds very securely to the lens hood. The plastic is transparent and thin enough to allow operation of all the controls right through the sleeve (vs, sliding your hands up inside). It's a very usable solution, although it does make adjusting the zoom a bit more difficult. 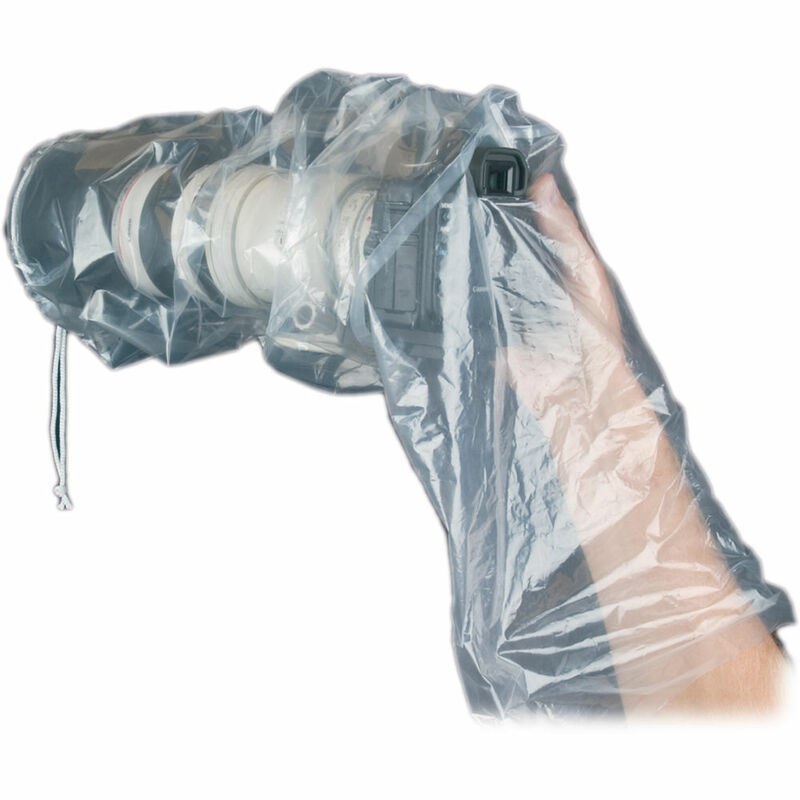 But again, this is intended to be more of an emergency or occasional rain solution.I've spent endless hours shooting football games in the rain and the protection provided is excellent. As long as you don't poke a hole in it, your equipment will stay dry. I'm able to reuse them multiple times.Pros: Very low cost, stores anywhere, excellent protection, low tech ease of use, able to see all of the camera's controls, works with tripods and monopods.Cons: Takes a few minutes to put on and get adjusted, makes accessing some controls a little awkward (but not impossible), far too long for short lenses.Bottom line: Excellent emergency protection during occasional bad weather for cameras with larger lenses. Those using smaller lenses should look for another solution. Rated 5 out of 5 by Velo Steve from Great Value I used this on a Canon 5D III with 300mm F4 and 70-200mm F2.8 lenses. It was a good size for either. On an ocean trip with moderate salt spray and in rainforest rain, the camera was always dry.The eyepiece hole takes a few seconds to pull into place, but it's easy. It also takes a few seconds to get your hand into the sleeve when damp - I just keep my grip on the camera between shots.I do recommend having more than one of these handy. They are not meant to last forever, and can split along the seams. I'm still a happy customer, because these are so much cheaper and lighter than the heavy-duty covers. Rated 5 out of 5 by Ethridge from Beats the heck out of shower caps! Okay, I guess the title says it all. I mean really, what can go wrong with a product like the Op/Tech Rainsleeve. Well, a lot can go wrong I guess, whenever we mix cameras, lenses, and rain. That's where the Rainsleeve comes into play. I've juggled umbrellas (picture a photog in the rain, shooting with one hand, umbrella in the other, clutching a towel under his chin, and the wind decides to pop the umbrella inside out. Or the double shower bag, or huge zip lock bag, or the just plain old putting your hat over the camera and wiping it off constantly tricks. Hence the Rainsleeve. I mean really, for a few bucks, you get two of 'em. And free shipping. It's a no-brainer. Rated 3 out of 5 by Ollie from Not up to Expectations This item didn't meet my expectations. I found it hard to manipulate over my Canon 5D Mark III with my 24-105 lens, or my Mark II with my 70-200mm. The pre-cut hole for the viewfinder is hard to maneuver in place after removing the eyepiece; returning the eyepiece to its place causes the rainsleeve to move back over the viewfinder. The plastic is thin and it tore the first time I returned the eyepiece. This is no big deal. The new hole is small, but I suspect it will get bigger with future removals and replacements of the eyepiece. A lot of what I do is on a tripod. After I placed a red stick-on label near the eye hole it became easier to find, but there's still a lot of excess sleeve to maneuver and it will take practice. Applying the rainsleeve while standing, with no tripod (say, as if you were walking outdoors and it suddenly began to rain), is even harder. It was actually a bit easier with the longer lens, which keeps some of the sleeve from bulking up over the camera body. Nevertheless, I found ziplock bags to be a much easier solution. After cutting a diagonal piece off one corner the bag can be pulled over the camera much quicker than the rainsleeve. A 2 or 2 and 1/2 gallon size easily fits over the 70-200 lens; a smaller size will cover the 24-105 just fine. A rubber band will hold the ziplock snug against the lens barrel. I found the drawstring of the rainsleeve would not grip the lens barrel firmly enough on the 24-105, so if you affix it when retracted the barrel will be exposed to the rain when you extend it. The rainsleeve is a nice idea and might actually work better the longer your lens is (and if your lens movement is internal rather than extendable), but for me I think I'll be using ziplock bags more frequently than the sleeve. But the rainsleeve is inexpensive so it's no great loss if you try it and don't like it. Can this one fit wuth the Canon 1Dx mark ii ? Yes, the OP/TECH USA 18&quot; Rainsleeve (Set of 2), B&amp;H # OPRS18, would be compatible for use with the Canon EOS 1D X Mark II DSLR camera. Do I need this if I have a weather sealed camera and lens? It is a small price to pay for ensuring that your camera stays dry. Answered by: Leola B B. Can this one fit with the Canon 1Dx mark ii ? Can a lens hood still be attached to the lens with the sleeve on? Yes, the opening of the sleeve is large and draws down with a drawstring. The sleeve covered the lens hood, 150-600 lens, camera and the top of the tripod. Would this fit for a Fuji Xt20 or Fuji X100f? I bought them to protect my Nikon Coolpix 900 from dust when I went to South Africa on safari. Truthfully, I'm an amateur photographer and ended up using a shower cap instead. The rainsleeves fit fine and I'm sure I'll use them at some point. will this sleeve fit on a Nikon D3s body? It easily fits a Canon 5D III with a 70-200 2.8 Zoom with lots and lots of room to spare. Very roomy! HOW EASILY CAN ONE HOLD CAMERA WITH TWO HANDS WHILE ACCESSING CAMERA CONTROLS AND SHOOTING?